Description: Who'd have thought i'd be tired of BNSF after a year after seeing probably less than 20 of them my entire life up till moving to Atlanta. Description: AFTER WAITING ON THE EAST END FOR AMTRAK THIS AND AN UNDOCUMENTED EMPTY HEAD TOWARDS GALESBURG. Description: 6391 is the second unit on this eastbound coal train. Title: BNSF 6391 leads a SB past the Old Glory. Description: heading a sb coal load out of the siding after meeting a NB empty coal. 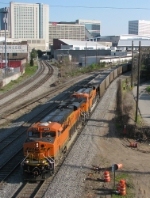 Title: BNSF 6391 and bnsf 9369 team up on a Sb coal load. Description: heading out of elsberry mo. Description: BNSF 6391 leads an empty in the yard, as BNSF 6988 can be seen on the right side, going back to grab the adds for their M train. Description: BNSF 6391 & 9563 sits at the pumps to be refueled and get ready for a new crew. Description: An eastbound empty grain train running 1+1 passes children fishing in Noxon Reservoir just west of Trout Creek on MRL. Description: 447 heads through Valley at 1247. Description: A Belle GE leads 446 south at 1436.